Historically, the first reliable document on the existence of Bronte, at least as a locality, is a privilege of the earl Ruggero of 1094 in which the name "Bronte" is used as border of two colonies. Other testimonies are of the 1105 (it concerns the concession done, in Sicilian dialect, by Ruggeri of a few territories "subta Brontis") and April 16th, 1345 (gift of king Ludovico to Manfredo Lancia of the fund "Ilichito", sited in " loci de Bronte"). 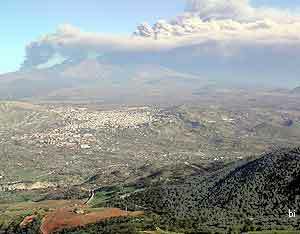 It is also historically verified that the current Bronte draws his origins from the fusion of several farmhouses scattered on the territory: they were 24 that in 1535 Carlo V, coming back from an expedition to Tunisi, arrived in Sicily and bound for Randazzo, orders that the Bronte Farmhouse be united to establish a single population. The farmhouses were true and real rural agglomerates, with a church of its own, a limited number of houses, the stables, a certain extent of surrounding land, the flocks and the families farmers and shepherds. The farmhouses interested in the fusion established by the big Court were the following: Bronte, Dàgali, Cisterna, Piano of The Palo, Ròtolo and Holy Vènera, Rapìti, Maniàce (had already begun their transfer since 1408, because of an earthquake, the malaria and the continuous raids to which were exposed), Piana, Cuntarati, Fitèni, Bolo, Carbone, Cattaìno, Placa Bajana (it moved from 1692 to 1730), Scalavecchia, Barrìli, Spanò, Cutò, Càrcaci, Castellàci, Ricchìsgia, Marotta, Cardà and Barbaro. The purpose of the fusion of the farmhouses was obvious: make more effective the presence of the State, the administration of the justice, but, above all, the fiscal collection (the "gabelle" and the "decime"), and also avoid the interest conflicts among the 24 farmhouses of the zone. The Bronte Farmhouse was the biggest for extension and also for inhabitants (the Radice calculates that in 1375 "were composed of seventy "fires" (families subject to pay the taxes) that, on the average of five for fire, multiplied by 70, would give 350 inhabitants". The farmhouses used to declare less "fires" in order to pay less tax, it was therefore already a big village well before 1535, with a central geographic position and an altitude dominating the Simeto valley. Safe from the lava and the malaria the village exercised a remarkable political, economic, religious, cultural and organizational influence and was the most suitable center to accept the various populations of the surroundings. The forced transfer in Bronte of all the inhabitants scattered all over the country-sides, under punishment to have their houses and cabins burned, was giving this way the origin to the primitive core of the current town. Consequent to the joining of the 24 farmhouses, new quarters and new churches rose in Bronte; the first quarters, that were taking the name of the church built in them, were rising in the shadow of the same churches (there were 24 of them in 1714; a church at the center of every district). Houses more or less modest, built with dry lava stones, picked up on the same area, huts where to accommodate the poorest people, narrow, tortuous and steep roads rose around the Annunziata church, and around the churches of Soccorso (help), San Rocco (today Sacred Heart), Greater or Santa Maria, San Giovanni. In the census of 1548, ordered by Carlo V, Bronte was counting about 3.545 inhabitants, in the next one, of 1570, the town counted 4.350 inhabitants. With the union of the farmhouses, all farmers or shepherds who did not like to be removed from their countryside huts, increased the difficulties, also the taxes grew, as the Spanish government wanted, but, with it, the poverty grew too, with needs and a new wish for freedom. The rough highlanders, poor and indigent, to whom were left only the "terreni sciarosi" (stony grounds), that they, with hard work, were taking away from the volcano, changing it in cultivable fields, began to take conscience of their rights and to claim them in public meetings. Ground for contesting, and it would have dragged centuries, were the methods used in the exercise of the "mere and mixed empire" by the officers of Randazzo and the woods and grounds usurped by the Big and New Hospital of Palermo to whom Pope Innocent VIII, in 1490, had given the abbey of Maniace and the territory of Bronte. the Nelson from 1799 up to the beginnings of 1900, when the castle and the Abbey, together with Bronte, were given by the Bourbon king Ferdinand, to the admiral Horatio Nelson, to reward him for having choked in blood the Neapolitan Republic. Centuries of feudal condition, submission of vassalage to the various princes that, for almost 500 years, have only subtracted wealth from the brontese territory, always impoverishing it and never trying to take some care of the local population. Centuries of infinite legal cases and rural struggles, sometime bloody, that lasted until the years 1963-65 when the farmers were assigned the ducal fields and the Council Of Bronte, that already in 1812 had obtained the emancipation from the ducal vassalage, obtained the full reintegration of nearly all his possessions. 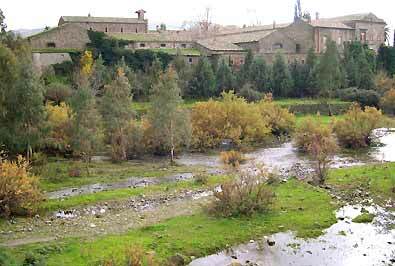 A view of the ancient monastery, risen on the banks of the Saraceno torrent. The history of Bronte coincides with that of this Abbey. Today is part of the complex called Nelson Dukedom and is property of the Bronte Council since 1981. In the bronze reliefs of the chiesa dell''Annunziata door are the names of all districts and all 24 farmhouses that from 1535 to 1548 were united by order Carlo V in the ancient Bronte and that in the Madonna Annunziata, their patron saint, found a new "common identity. 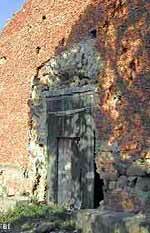 The door is work of Mimmo Girbino. Of the 24 hamlets that constituted Bronte’s origin, the Placa Bajana hamlet deser­ves a particolar mention, if nothing else, because it had an autonomous life, as repor­ted by Benedetto Radice in his “Memorie storiche di Bronte”«… was united to Bronte by a “custom” of the 1692, and not as believed, towards the 1535 with the other hamlets». 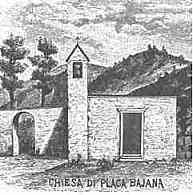 Even after the union many peasants continued to live at the Placa suburb and up to 1776 paid taxes ("le gabelle") to the Council; Bronte’s archpriest started also to act as archpriest and parish priest of Placa Bajana and took care of the existing church there. This opinion is comforted also by “a bronze coin published by Imboof-Blumer, in which can be seen on one side the head of a fluvial god and on the other a dog biting into a fallow deer, with the Piakui legend (Piaxos ancient Greek city placed on the western side of the island, over the Nebrodi mountains). «The hamlet, according to the old circumscription, was located in Troina’s territory. It still has a church dedicated to San Michele Arcangelo, whose statue was brought to the Main church, and is there preserved in a niche to the left of the Sacramento chapel. The pediment and the church’s mosaic façade of reddish bricks, in its rustic simplicity, produces a sensation of something infinitely proper and solemn. 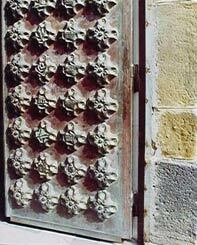 I think that could belong to the XII century». Alongside the church raises yet, threatening in the open space the baronial castle and its gloomy jail, of which can still be watched the gate and the iron grating. Still in good state there are two large salons; on the jamb of the first can be read the year 1710, could be the date of the door remaking. The tower that dominated the valley of Simeto that runs on the slope of Placa Bajana has been demolished. Next to the church there is the small cemetery, where until 1730 some corpses were buried, as shown in the Bronte’s Main church registers“. "The Randazzo court, in his famous privilege of 1348, counted it among the hamlets subject to the city’s mere and mixed empire, under the name of San Michele; but really Randazzo never exercised any power, being the hamlet, ab antico, ruled by its barons”. Long is the series of barons succeeding each other in the rule of the Hamlet and the feud (that included also large extensions of woodland). Benedetto Radice makes a listing of them; from the first one (when ”the village was ruled by Virgilio from Catania, but he rebelled against king Federico II and was deprived of his possessions and given to master Giovanni di Baguero a Messina’s doctor, …as results from the privilege of 13th of febbruary 1299 given in Caltagirone) and to the last (Gaetano Paternò Castelli Rizzari dei Duchi di Carcaci sold to him by the prince of Bajana Alcontres Moncada from Messina, for 180.000 onces, act 29 March, 1774).